Can I save my game? Your game is locally saved automatically after each game is over. How do I transfer my saved game to a new device or if I have to reset my current device? Use the “Export Game Save” option in the “More” section of the game menu if you need to reset your device or want transfer your game state to a different iOS device. The game crashes or plays choppy when I play. What should I do? Check to make sure you have enough free space on your device (in SETTINGS > GENERAL > USAGE > 'Available'). This game, like many applications, needs some room to operate. Make sure you have at least 100MB or so of free space on your device. This is only usually a problem if your device is totally full. Close any background apps. Double-tap the HOME button to bring up the list of background apps currently open. Touch and hold on any app until they become 'nervous' and reveal their close buttons. Tap to close any or all of the apps (the apps are not deleted from your device, they are just closed and will start clean next time you open them). Reset your device. Hold down the POWER button until the device starts the shutdown procedure asking you to swipe to turn it off. Turn it off, and back on, then try playing again. File a bug report! If none of the above works, or if you frequently experience crashes, please let us know!You can contact us to file a bug by using the form in the website contact section. Make Shapes based on proportion, not size. Shape grades are based on speed and accuracy. Cloud Form star grades are based on the average of your Shape grades. Try short swipes instead of long swipes - it will help make you quicker. Try using your pointer finger instead of your thumb to make the slices. Your rank increases after you complete three missions. The distance you travel during the game increases as you rank-up! Frenzy Coins double the distance and amount of energy you earn for creating Shapes and Cloud Forms. Buy power-ups & personalize your game by collecting coins as they rotate around the planet. You can buy multiple power-ups of the same type. When you start a new game they will automatically activate. Buoy power-ups will override Starter Booster power-ups. You can share your rad custom Ship with your friends on Facebook & Twitter. August 29th, 2012 by B.o.B. While designing the Strange Clouds: The Game user interface we learned that sometimes, the easiest way to see the forest through the trees is to cut everything down and print out a bunch of paper. Our initial menu system flow chart (above) was great and provided an informative stepping-stone for when we moved into design. We used a service called GoMockingBird.com to create a shareable, fully editable online flow chart. However, when we moved in to design, that nice flow chart was reduced to a terrible sea of folders (below). Having an ever-present giant menu map made the accompanying psd folder structure incredibly easy to understand. It also helped us to fix any potential flaws in our original flow chart so that every player has an intuitive, and fun, gaming experience. Pheeeew, there's that forest! August 28th, 2012 by B.o.B. The start screen for Strange Clouds: The Game was a trip in itself. Take a look at some of our initial designs! We wanted to capture Atlanta, B.o.B's hometown. This was our first pass but it's just way to dark, we are supposed to be having fun here! This was a revisit after a few months of stewing. Definitely brighter, MUCH brighter. This was a cool ship, but it just didn't leave us enough customization options. Another revisit a day later with an alternate ship. The background is almost there, just needs a bit more clarity and DRAMA. We still were not feeling the ship! THERE WE GO! Our game designer took a stab at it and was able to put all of the pieces together. Doesn't it look amazing? More on that ship design later! August 27th, 2012 by B.o.B. If you're going to travel through space, you ought to do it in style. When we set out to design a space ship for B.o.B's Strange Clouds the Game we knew it had to be out of this world awesome. We were influenced by custom car culture, classic video game vehicles, crazy Japanese conversion vans, and 90's import throwbacks. We tossed these ingredients into our mind-blender and out came B.o.B's SpaceWhip. Once the basic vehicle was looking shipshape, we began to dream up all the add-ons and accessories. The final 2D ship and accessories were then translated into 3D using Maya. The final product is a SpaceWhip we would be proud to roll up in. 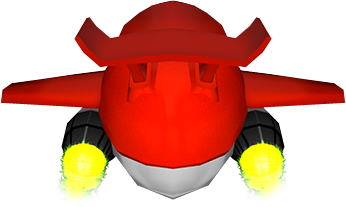 Check out the game, customize your own SpaceWhip and share it with your friends!